One thing you have to say for Caroline Pigozzi: She’s got guts. The French journalist talked her way into getting behind the scenes at the Vatican to observe the late Pope John Paul II in his day-to-day rituals inside St. Peter’s, inside the offices of the Holy See, and inside the papal apartment. Once she gets her toe in the Vatican door, she meets and befriends the right people who open yet more doors, and her persistence at documenting what she see and what she hears makes — surprisingly for me — interesting reading. 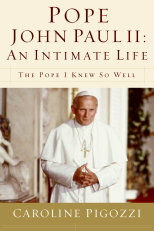 As I was, you may be poped-out on John Paul by now, but this very different, detailed look at the life of a pope isn’t so much about what the pope said or did as it is about how the pope lived: what he enjoyed, whose company he relished, how he operated as the leader of a world-wide church. With the “ski” at the end of my name, it was interesting for me to read about the special treatment Polish clergy and seminarians received and about the “parallel curia” of Poles that some accused the former Karol Wojtyla of building at the Vatican. Fair warning: Pigozzi as an author is pretty much a hero-worshiper, so you’re not going to read about the dark side of John Paul (if there is one) in this book published under the Faith Words imprint (http://www.faithwords.com/).